This may look like just another wormtube on a shell — a recurring theme on this blog — but it is special, of course. 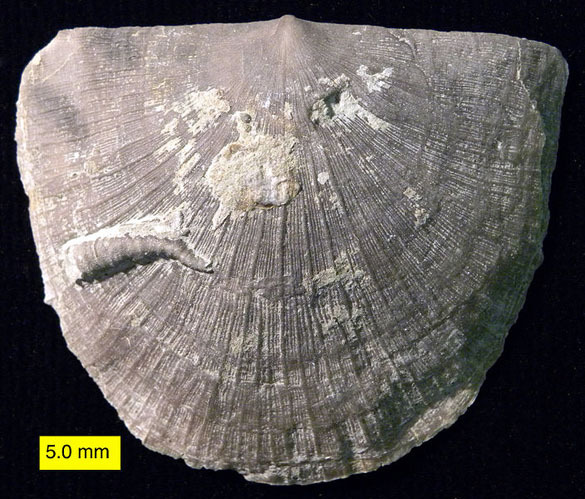 This is the common Paleozoic genus Cornulites Schlotheim 1820, specifically Cornulites flexuosus (Hall 1847). 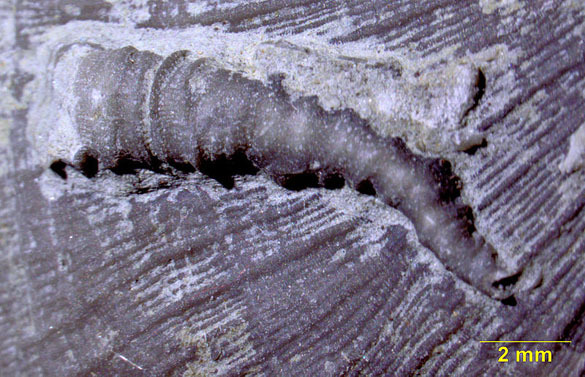 It was found in the Whitewater Formation (Upper Ordovician) during a College of Wooster field trip to southeastern Indiana. 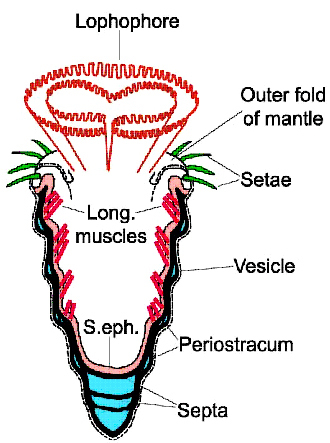 Suggested cornulitid internal anatomy (from Olev Vinn). Cornulitids (Ordovician – Carboniferous) belong to a large group of tube-dwelling organisms that, surprisingly, may be closely related to brachiopods and bryozoans. Cornulitids, along with fellow tube-dwellers the microconchids, tentaculitids and hederelloids, have a foliated shell ultrastructure with various other features indicating they may be part of a larger group called the lophophorates (see Taylor et al., 2010). Much work still needs to be done on their systematics and paleoecology to sort out the evolutionary relationships here, but we have a good start. 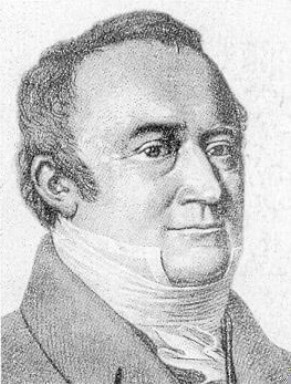 The genus Cornulites was described and named by Ernst Friedrich, Baron von Schlotheim (1764-1832), a German palaeontologist and politician born in Almenhausen, Thuringia, Germany. As a noble, he was home-schooled (as we’d say now) and then sent to the Gymnasium (like a high school) in Gotha, Germany. After graduation, he attended Göttingen where he studied political administration and the natural sciences with Johann Friedrich Blumenbach. He enjoyed geology very much and so went off to Freiburg to learn from the famous Abraham Gottlob Werner of Neptunist fame. One of his friends was the scientist-explorer Alexander von Humboldt. After this extraordinary education, Schlotheim entered the civil service in Gotha in 1792, eventually rising all the way up to Lord High Marshal a few years before his death. During his administrative work, though, he continued serious paleontological studies, being one of the first paleontologists to use Linnean binomial nomenclature, making fossils much more useful for stratigraphy and later evolutionary studies. Schlotheim had some very progressive ideas about what we would later call uniformitarianism, and he recognized that geology could tell a history of the Earth quite different from that outlined by theological scholars. Here’s to the intellectual innovations and courage of Baron von Schlotheim and the little fossil wormtube that reminds us of him! Morris, W. R., and H. B. Rollins. 1971. The distribution and paleoecological interpretation of Cornulites in the Waynesville Formation (Upper Ordovician) of southern Ohio. The Ohio Journal of Science 71: 159-170. Vinn, O. and Wilson, M.A. 2010. Abundant endosymbiotic Cornulites in the Sheinwoodian (Early Silurian) stromatoporoids of Saaremaa, Estonia. Neues Jahrbuch für Geologie und Paläontologie 257: 13-22.